A wet and windy day to start the month as `March comes in like a lion`. Let us hope for better weather as the month progresses. I was delighted to be able to present this apron to Caroline Crook and Vic Charlesworth for display at the Warrington Masonic Museum. On the Friday morning Maureen and I were off to Manchester. I had a luncheon meeting at Bridge Street and Maureen had our ‘little plastic card’ so was pleased to spend the day looking around the shops. Late afternoon we left Manchester, heading down the M62 to Warrington for an evening meeting at Winmarleigh House, the Masonic Centre where the Warrington Museum of Freemasonry is situated. 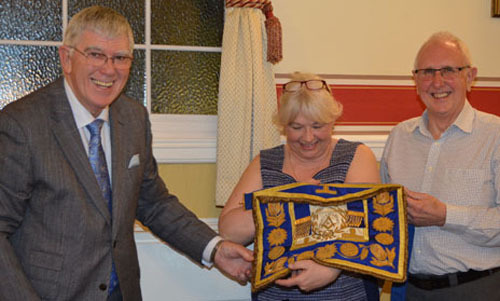 They received full accreditation as a Museum of Freemasonry in September 2018, so it was an evening with the `Friends of the Museum` to celebrate their success. Over 100 brethren with their ladies attended a dinner followed by speeches and presentations to the museum. If you have never been to see all the artefacts here in Warrington, you should really take an opportunity to do so. What a wonderful evening we all enjoyed. On the Tuesday of the following week, I made my way to Hope Street, Liverpool for my Knights Templar Preceptory installation meeting. 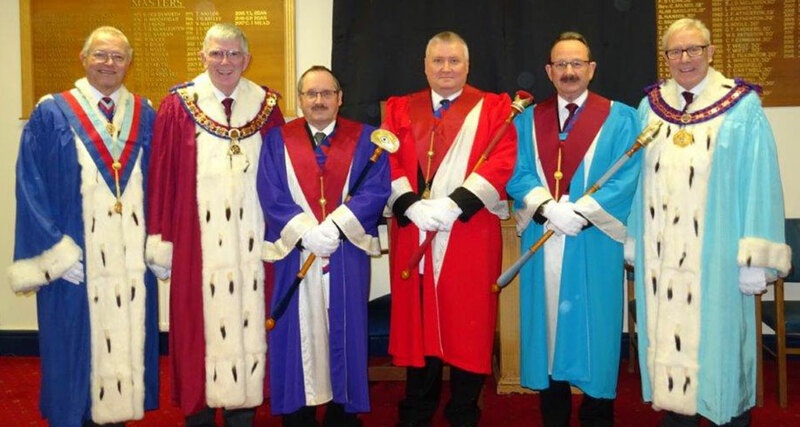 We were delighted to welcome the Provincial Prior and a number of his officers as we witnessed my Deputy PrGM Phil Gunning, being installed as the Preceptor. A great evening was had by all who attended. The next day, after breakfast, I drove to Wellington Park, for a Group Chairman`s meeting. Most of the group chairmen were present and we had a very interesting and informative meeting. A very memorable day for Rob Roberts at the installation meeting of the Lodge of Charity No 2851. Following a short walk on the promenade with Maureen the next day, I was off to Litherland that afternoon. Keith Kemp and I travelled with Barry Fitzgerald to Litherland Masonic Hall for the Crosby Lodge No 3714, installation meeting. The meeting was very well supported, and Frank Umbers led the grand officers who were out in good number that evening. Well done, Crosby Lodge! 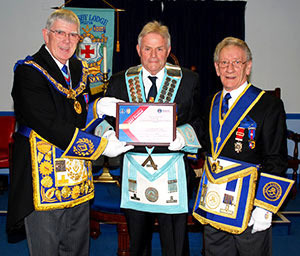 A new master and a Festival Patron’s certificate. We enjoyed a great ceremony conducted by Andreas Johannessen who installed Eric Moran as master. Compliments to all who took a part in this excellent meeting, at which I was presented with a number of cheques for various charities including the MCF Festival. We then all retired to the dining room for pre-diner drinks and then an excellent dinner which preceded the usual speeches. The master’s song, sung by Don Fraser, was something very different this evening and quite unusual. A brilliant evening. .The following day, I was again back to London on the train. I was accompanied on this trip by Phil Gunning, Geoffrey Bury and Paul Broadley. We were attending the Quarterly Communication of Grand Mark Lodge and we were joined in London by a good number of brethren supporting Keith Beardmore. A very good meeting although the Grand Temple was by no means full. We enjoyed a presentation by some of the supported charities and met with many of the recipients of the grants. Following the meeting we adjourned to the Connaught Rooms for the dinner, which on this occasion was very good. The next morning, after a very leisurely breakfast we walked down to Great Queen Street for the Quarterly Communication of Grand Lodge. Today, Kevin Poynton, David Ogden and Steve Clarke joined us for the meeting. The Grand Temple was full to capacity that morning and following the re-election and proclamation of the Grand Master, by Oliver Lodge, the Grand Director of Ceremonies, we had a presentation given by John Pagella, the Grand Superintendent of Works on ` A year in the life of the Grand Superintendent of Works` which was extremely interesting and informative. We did not stop for the luncheon as our train home was mid-afternoon and we had to make our way back to Euston. A good and uneventful journey home, following an excellent sojourn to UGLE. Welcoming guests at the Grand Ball and Banquet. Friday 15 March saw Maureen and I making our way to the University of Bolton Stadium for the annual Provincial Grand Ball and Banquet. This was attended by some 530 brethren and companions with their wives and partners. What a wonderful evening. Maureen and I were joined by Phil and Anne Gunning, John and Shelia Karran and Barry and Sandra Dickinson as we received the many attendees at the initial reception. After a long reception we entered the ballroom to great applause and then took our seats for dinner. An excellent meal was enjoyed accompanied by music from Ray Dainton. We then held the ‘Grand March’ followed by dancing until midnight. I think we were all exhausted by then and it was off to bed for a good night’s sleep. After a fairly relaxing weekend, Maureen and I travelled to West Derby in Liverpool the following Monday morning. We went to St Vincent’s School for the Blind and Partially Sighted, where we were accompanied by Kevin Poynton, Mark Matthews, Steven Kayne, John Murphy and many other brethren from the Garston Group. We were there to make a presentation of £35,000 to the school. It was a great joy to behold those children at school who were so grateful to Freemasonry and the WLFC for such a great donation which would assist them in many ways with their daily lives. A fabulous experience at St Vincent’s School. We then went on to Zoe`s Place, the Children`s Hospice, where we were able to donate £10,000 from the WLFC to assist the vitally important role which this hospice plays in West Lancashire. On 19 March, in the late afternoon, Keith Kemp and I travelled to The Palace Masonic Centre, St Annes for the South Fylde Group Dinner. This was a very well attended event and we had a very interesting Q & A session with the masters and first principals, together with many other brethren from the group. This was followed by dinner and speeches. The group chairman, Ian Ward, officially retired and John Robbie Porter was announced as his successor. A terrific evening in the company of many friends. A couple of days later, I was off to Blackburn for the annual Provincial Grand Chapter Convocation for the Province of East Lancashire. I was accompanied by many of my Royal Arch Cabinet companions. Sir David Trippier presided over the meeting which was very well attended by the companions of East Lancashire. After the meeting we retired for pre-dinner drinks and then had dinner together with very humorous speeches before making our way home after a most enjoyable occasion. The following evening, I attended my Rose Croix chapter enthronement meeting in Morecambe. It was well attended by members of the chapter and a good number of visitors who came to support the evening. Maureen and I then enjoyed a very welcome and relaxing week-end. The weather was good to us and we had the opportunity to take a nice long walk along the promenade to enjoy to views and take in some excellent fresh air. We also had time to spend in the garden, just tidying up after the long winter. The last week of the month and an early start ton Monday morning. I was off to Leyland to join up with Peter Taylor and Neil Lathom for the journey to Stretton in Cheshire, for their annual Provincial Royal Arch Convocation. 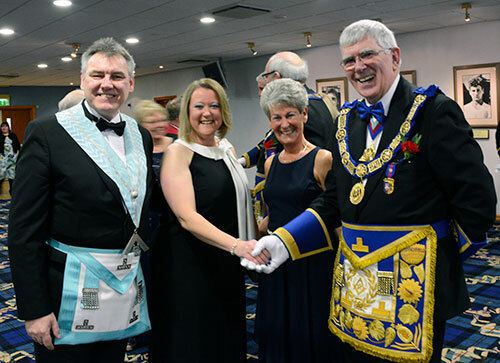 This was very well supported by the Cheshire companions and their guests and we all enjoyed the meeting presided over by Stephen Blank, the Grand Superintendent. Following an excellent meeting and luncheon, later in the day I travelled to Prescot Masonic Hall with Colin Rowling, for the joint convocation of the St Helens and Prescot Chapters. I received a very warm welcome and a lovely cup of tea before we had the opportunity to meet with many of the companions prior to the presentation in the chapter. Companions from the group gave an excellent presentation of `The building of a chapter`. We also enjoyed a most welcome festive board with some short speeches, before making our way home after a very long, but most enjoyable day. Following a somewhat relaxing day I was off to Fleetwood on Wednesday, for the centenary meeting of Hesketh Chapter No 950. We had an early rehearsal for this special meeting which was attended by some 90 companions. We met in Fleetwood Masonic Hall and received a wonderful oration from Rev Cannon Godfrey Hirst which was followed by a short history of the chapter prepared and delivered by Walter Porter, a senior member of the chapter. Following the meeting we moved on to the North Euston Hotel for the banquet. It was there, 100 years ago, that the chapter was consecrated, and it was wonderful to be in the very same room where it all began, so long ago. Centenary celebrations at Hesketh Chapter. On Thursday, I was back at Wellington Park, Leyland on a beautiful spring morning. A Craft Cabinet meeting was convened and apart from two of my APrGM`s who apologised for their non- attendance, it was a full house. We had a good meeting, discussing many very topical and relevant issues before we all dispersed to attend various other meetings. I, along with Peter Taylor and Phil Gunning went to view the new Provincial offices which are almost complete. We expect to move in next week. It was then time to head back home to prepare for Provincial Grand Lodge. We had good weather over the weekend, so `March is going out like a lamb` which gave me time to relax, enjoy some short walks and potter in the garden. I must say, I am looking forward to April.